The colors suggested are "old ivory" for one set, and "morocco red" for the other; the latter color is a sort of brilliant Persian orange shade, with a delicate white veining, which will provide a striking spot of color for the room in which this set is displayed. Other dark colors might be chosen, of course— such as jet black, blue marble, jade, etc.—depending on your taste and the general color scheme desired. In the commercial manufacture of plastic articles, many corners are cut, to save material and machining; but to the average home craftsman who wants only to make one of a kind, a little wastage of material will result. Believing, however, that there may be among our readers some who are looking for articles which they can manufacture and sell at a profit, we will describe two methods of constructing this chess set, one for the amateur and the other for the professional worker. The amateur is first to be served. Colored plastics are available in rods, tubes, sheets and various special shapes, and it is impossible to buy less than one full piece. Since full pieces are not required to make this set, there will be enough material left over for a number of rings, pins, salt-shakers or other articles, although, if you are making a dozen or so sets, the material can be figured to come out more evenly. For one set, you will need one piece each of white and morocco red 1 1/4" round rod, and one piece each of 7/8" white and red round rod. The two white and two red horse-heads can be carved bodily out of some of the left-over rod, and it is possible to purchase a plastic "shape" with a horse-head profile, thus saving considerable material and labor. The kings, queens, rooks, bishops, and the bases of the knights are all turned from the 1 1/4" rod in the lathe, according to the contours shown in the sketch, Figure 48. Since a little waste is not important, the easiest way is to turn one piece at a time, chucking the material at the live end in a chuck. This will enable you to completely finish and polish the entire piece at one lathe-setting, the last operation being the cutting-off of the finished piece with a hack-saw (while running), leaving about 1/2" or 3/4" of waste stock in the chuck. The little cross on top of the king is filed out of a piece of waste, and cemented in place in a hole drilled for that purpose. (*Reprinted by permission from "Mechanics A Handicraft"). Fig. 47. 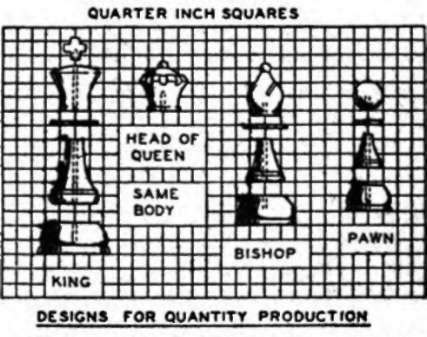 Contours and dimensions for the chess-set described in Project 35, when only one set is being; made. (Sketch courtesy "Mechanics& Handicraft"). This material cannot, of course, be chucked as tightly as metal, so it will be necessary to use caution in applying pressure to the chisel, as well as to watch the chisel-angle carefully so that it does not "dig in" and pull your work out of center or out of the chuck entirely. Also, bear in mind, when working on thin cross-sections, that the material bends when it gets too hot. The "parapets" in the top of the castle are filed in, by cutting four notches, 90 degrees apart, with the edge of an ordinary flat file. The queen's crown is made by filing eight notches around the top rim with a rat-tail file. The bishop's mitre is a simple hack-saw cut. The knight's head, 3/8" thick, can be sliced off the end of a special horse-head plastic "shape," or carved bodily out of a piece of waste rod stock (if yon are only making one set, as it would not be worth while to buy a standard length of 10 1/2" in order to save carving four pieces 3/8," thick). After jig-sawing to the proper profile, the carving of the horse-head is simple, as the design is more or less symbolic, or conventionalized. If you have no power carving tools, a few file-marks to indicate the name and forelock, the cut between the ears, and a little shaping at the neck under the jaw-bone, will suffice. The pawns are turned from the 7/8" stock, either one at a time, or four at a time. If four at a time, then it will be necessary to shape the rounded top (where the cut-off occurs) by hand, although this is not difficult. The horses' eyes can be made in two ways—one is by chucking a piece of 1/8" tubing, with roughened edges, in the drill-press or lathe, and making circular 1/8" indentations in the proper places, representing the eyes. The other way is to drill a 1/8" hole directly through the two eyes, and insert therein a 1/8" rod of contrasting color. For quantity production, a little different procedure is followed, to save material and machining. Only the bases are turned out of the 1 1/4" stock, as too much material and time would be wasted in reducing this large diameter. An entire rod is turned at one setting, between centers, and the cutting-off done later with an abrasive wheel or saw. All of the pieces except the rook are broken up into several sections, as shown in Figure 49, and turned from respective sizes of rod which involve the least waste. 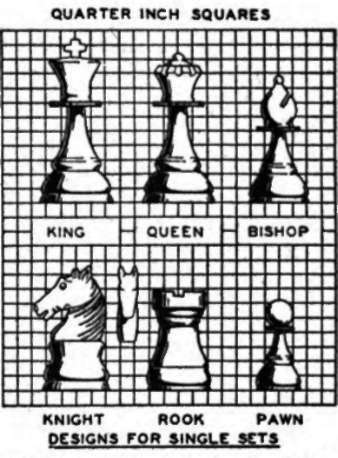 The bases of the king and queen (identical) and of the knight are from rod; the rook and the bishop's base from rod, and everything else from 7/8" rod, except the pawns, which are from 5/8" rod. Fig. 48. Contours for chess-set for Quantity production, show-ing considerable savings by using smaller-diameter rods for the upper sections. The various parts are held together with threaded brass rod. (Sketch courtesy "Mechanics & Handicraft"). These pieces are held together with 6/32" threaded brass rod, cut to the proper length, and with the end rounded off. By drilling holes of the proper size in the two end pieces, this brass rod will cut its own threads and hold well. All other holes except those in the two end pieces are, of course, clearance holes.